Home » konad » Heart Konad?! Have you ever messed something up, then tried to fix it by doing something else to it? Well that's what happened here, the white hearts came out horrible, so I tried to cover it up with more hearts, and then THAT looked even worse! So then I covered that up with black hearts, and there you have it. I also stamped them upside down aaaahh. On the bright side I think I got the hang of how much pressure to use when scraping and picking up the image. Honestly, I like the layered hearts with different colors. I want to do something like that with my Konad... maybe using the animal prints or something. Do a lighter and then a darker offset. I think it's cool! And I stamp upside down all the time! That way you can look at them right side up! 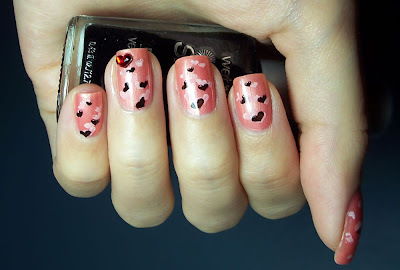 Pretty heart manicure. Beautiful look for your making mistakes that I can't see!